At Adventure Park, we have Visalia attractions that will amuse all ages! As a family fun park, we want families and friends to come and enjoy being together in a safe environment. We are continually upgrading our attractions. You’ll love our new “Adventure Cards” instead of tokens and tickets. These cards allow more flexibility so we can easily make special offers that were previously unavailable. Check our Weekly Specials and Events pages regularly to see what new special offers are available here at our Visalia attraction park. If you’re looking for a great family fun park in Visalia, you’ll find that Adventure Park has everything you’ve been searching for and more! We are located near Sequoia National Park and Kings Canyon—you can find us right off Freeway 198 at Akers. Our seven-acre Visalia attraction park offers Go Karts, Miniature Golf, Bumper Boats, a state-of-the-art Arcade, Batting Cages, Laser Tag, and more. See below. At our Visalia attraction park, your family will create lasting memories that you can cherish together for years to come! For your safety, please remember during rain or bad weather the Family Go Karts, Kritter Karts, and Batting Cages may be closed. 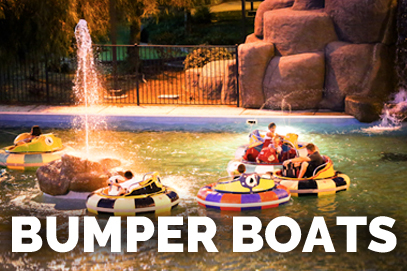 When there is visible lightning the Bumper Boats will also be closed. We strive to keep our prices low without compromising the quality of our guests’ experience—as a result, prices and special offers are subject to change without notification. 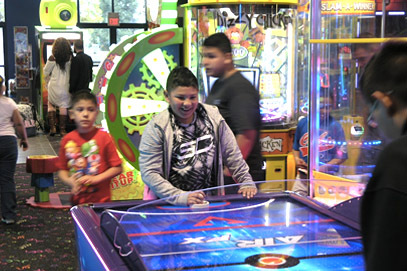 No matter your age or skill level, our Visalia family fun park has an arcade game for you, your kids, and friends. Our arcade floor is packed with the industry’s newest high-tech games. Plus you’ll win points to redeem for prizes. The kids love that! After an afternoon or evening of playing arcade games with your family, your kiddos will go home with a prize they selected from our well-stocked redemption center. Don’t be surprised if you see your little ones snuggled with their new “treasure” as you tuck them into bed that night. Plus with our BONUS BUCKS rewards, you get even more time to play! Load $20 onto an Adventure Card — Get $2 in Bonus Bucks. Load $25 onto an Adventure Card — Get $5 in Bonus Bucks. Load $50 onto an Adventure Card — Get $12 in Bonus Bucks. Load $100 onto an Adventure Card — Get $30 in Bonus Bucks. Bonus Buck Specials are available on any day of the week. Bonus Bucks may only be redeemed in the Arcade on non-merchandiser games. When you hop on one of our Go Karts, get ready to experience the thrill of open-air driving, with the wind blowing across your body. The body-free design of the Go Karts makes the drive feel faster. With our simple loading and unloading procedures drivers and passengers are able to get on and driving quickly. The best part is that kids 54 inches and taller can drive! RESTRICTIONS: All drivers must be a minimum 54 inches tall. Passenger must be a minimum of 40 inches tall. All Passengers not eligible to drive themselves must be driven by an individual over 16 years old. 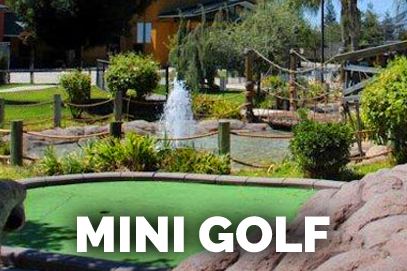 Work on your putting skills by challenging friends to a game of Miniature Golf on the best 18-hole miniature golf course in the Central Valley. With the trees and beautiful landscaping, you'll almost feel like you're on a real golf course. The theme is our very own Sequoia National Park, one of many California treasures. PRICES: Adults & Children Over 7 years: $9 | 7 and under: Free with paying adult. 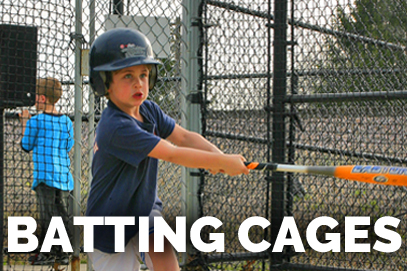 Our batting cages are a favorite with kids and grown-ups alike. Who doesn’t like feeling like a “Big Leaguer” swinging for the fences? With a swipe of an Adventure Cards and a touch of a button, batters can choose baseballs or softballs pitched at varying rates of speed. RESTRICTIONS: Time rentals are NOT available during peak times, such as weekends; or, after 4 p.m. on Fridays. This attraction is NOT included with the purchase of an all-day wristband. ALL BATTERS UNDER THE AGE OF 18 ARE REQUIRED TO WEAR A HELMET WITHIN THE CAGE WHILE BATTING. Once a driver climbs aboard one of our electric boats, it doesn’t take long for the splashing, bumping, and squirting of other boaters. Fun in a blue lagoon! Approach the waterfall and geyser at your own risk; they can give you a good soaking. Don’t say you haven’t been warned! RESTRICTIONS: All drivers must be a minimum of 44 inches tall; passengers must be a minimum of 40 inches tall. All passengers must be driven by an individual over 18 years old. 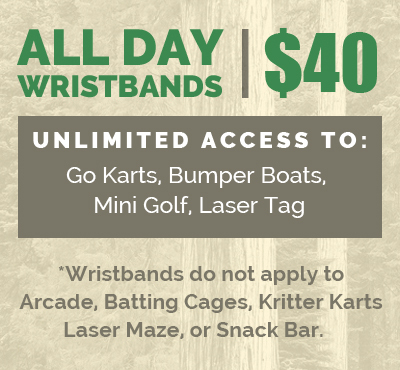 Challenge yourself, your friends, or your family with our newly upgraded Laser Tag. It’s an exciting, competitive game. Find out who dominates in the world of Laser Tag! Great for birthday parties, company gatherings, or even corporate team building exercises! Ninjas Wanted! Can you escape the vault? Challenge yourself and your friends in the Great Vault Escape. Maneuver through laser beams at a variety of different levels to reach the Key and Money Bags. 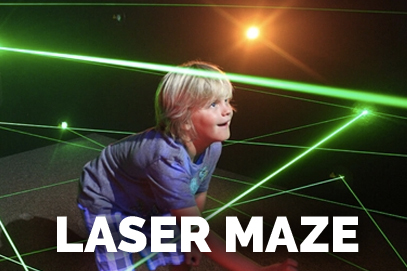 Then escape the maze without being detected by the high-tech lasers. The Laser Maze also includes Beam Buster, great for all ages, where players bust as many beams as they can before the clock runs out. The Great Vault Escape and Beam Buster can both be played, single player or two players. Don't forget to save your scores and challenge your friends. Are your kids not quite tall enough for our Family Go Karts? 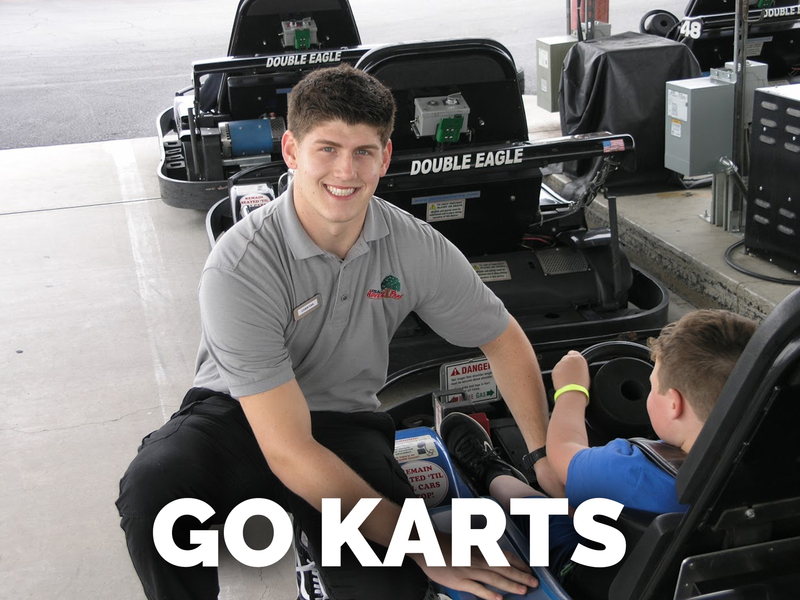 With our Kritter Karts, your kids can still experience the thrill of driving on a racetrack! 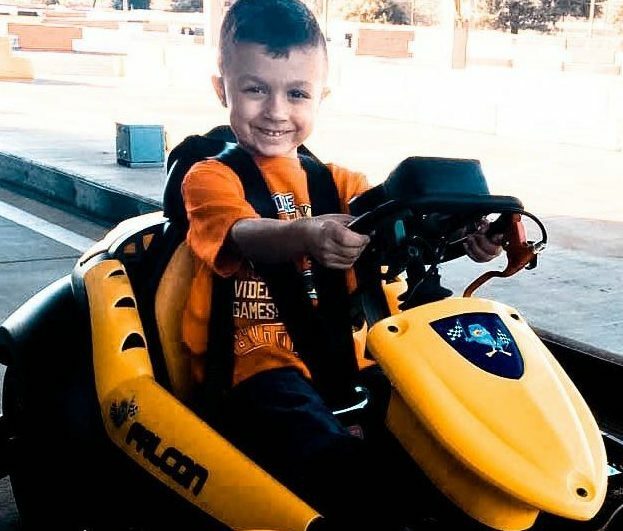 Our mini go carts travel at a very safe, slow speed for children. If necessary, the attendant can stop all carts remotely with the press of a button, like when a driver goes the wrong way! Kritter Karts are suitable for drivers as young as 5 years old and weighing less than 90 lbs. RESTRICTIONS: All drivers must be 36 inches tall but under 54 inches tall and weight less than 90 lbs to drive. This attraction is not included with purchase of a wristband.